This is inspired by a Jamie Oliver recipe, but modified to make it more user friendly. The results are lovely and would translate so well to a summer BBQ/dinner party, where you could cook up a whole fillet of beef and slice it for each serving. Classy and lovely. In a saucepan, gently wilt the garlic and leek in a good sploosh of extra virgin olive oil. Once tender, add the beans, milk and white wine and simmer over medium heat for ~10 mins or until the mixture has softened. If the liquid runs out, add a little water, more white wine, or more olive oil. Season with salt, pepper and nutmeg to taste and keep over low heat to retain warmth. Sprinkle over the parsely. In a grill pan, fry the steak over very high heat until cooked to the desired state. Flip to cook the second side. Once the second side has been cooked to ~1 min before perfect cooking time, remove to a board and slice. Cover with alfoil for 1 min or until meat has been appropriately rested. 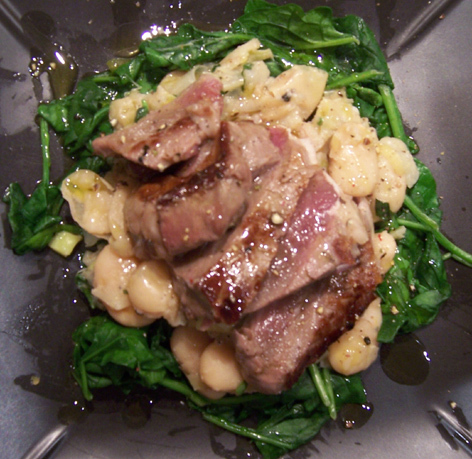 Serve sliced steak over the bean and leek mixture and eat immediately. I served this over a bed of wilted spinach which was lovely. Serves 1 as a main course. Calories (based on a 100g piece of steak using skim milk) are approximately 380. Serve this with a bold wine. A recent joy of mine has been the limited release Richmond Grove 2002 shiraz. This wine is well priced (considering the quality) at $22 and is available in selected bottle shops now. Entry filed under: food, wine.